St Nicholas Way offices are located in the town centre of Sutton in Surrey and offer a range of small to large suites for rent. With air-conditioning in place, this modern building has a broad selection of amenities including meeting rooms, kitchen facilities, and underground parking. There is a staffed reception and lobby area at the entrance, which is perfect for companies that need to welcome guests when they visit. All offices for let are ready to move into and consist of furniture and IT points for broadband and telephone lines. 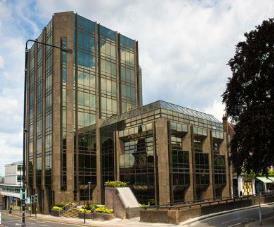 Benefiting from a mainline station close by, this serviced office has fast transport links to London and beyond. Security systems are in place and access to the property is available 24 hours a day.